Home » Blog » Launch of the new anti-bribery / anti-corruption self-assessment online tool: where does your organization stand? We have developed this tool based on feedback from internal and external experts, as well as drawing on best practice standards and frameworks from governments, private sector experts, inter-governmental agencies, and civil society organizations. At the end of the assessment it will assign grade level to your organization and provide some advice on areas for improvement. We hope that this self-diagnostic test (which only takes about 4 minutes to complete) might help you and your organization to identify possible weaknesses in its current program and point to areas of possible improvement. Of course, the self-assessment tool is based solely on the respondent’s own perceptions, which may not always be a true reflection of actual circumstances. As such these results, of course, are not a definitive assessment of your organization’s anti-bribery management system, but they may give you some insight into its robustness and allow you to benchmark your program against emerging best practice in the field – and have a little fun. If you or your organization is interested in conducting a more comprehensive and independent analysis of your company’s anti-bribery program to highlight some of the more critical issues to action, please feel free to contact us for more information. 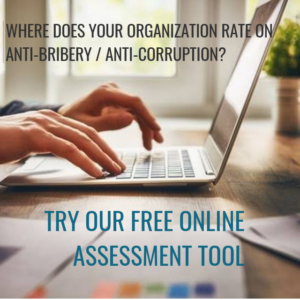 Partager la publication "Launch of the new anti-bribery / anti-corruption self-assessment online tool: where does your organization stand?"